Looking for pre-owned or NEW bakery equipment? 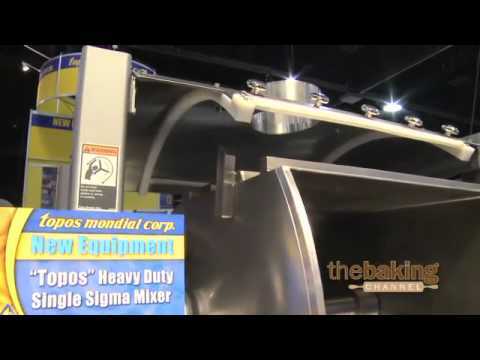 "We've got it your needs covered"
Topos Mondial is the answer to your bakery equipment needs. Topos is a full-service bakery equipment sales and consulting company that has been specializing in high quality remanufacturing of all types of bakery equipment with an emphasis on engineering since 1959. We offer complete bakery engineering solutions to meet your production needs. Our skilled professionals can engineer, layout, remanufacture and install a single piece or an entire bakery plant. With Topos Europe, our full service engineering and fabrication facility located in Central Europe, our company also supplies NEW high quality industrial baking equipment world wide. Topos Mondial continues to be a bakery machinery supplier for the United States, Central and Eastern Europe. Our designs, remanufactured, rebuilt and NEW equipment have been and continue to be innovative, heavy duty, efficient and reliable. With such a wide variety of NEW, remanufactured, rebuilt, reconditioned, and "as-is" pre-owned equipment, Topos Mondial can help any bakery large or small, upgrade and expand it’s manufacturing capabilities at the most competitive price. Topos Mondial bakery production consultants can assist you in assessing your overall facility and make recommendations as to how to increase productivity, improve quality, add new product lines, or increase efficiency, flexibility, cost effectiveness, and automation. We have worked domestically and internationally to improve bakeries standards of quality control and automation in the production processes. Topos Mondial Corp. is Located in Pottstown, PA and has approximately 300,000 sq ft total of warehousing, machine shop and offices. We employ 30 experienced skilled craftsman and staff in our US facility and over a 100 in our Europe facility. Topos Mondial Corp has a full 30,000 sq ft remanufacturing shop facility in the United States that we utilize to build all types of bakery equipment. We also have a 400,000 sq ft of Manufacturing, Warehousing and Office Facilities in Europe with high tech machine manufacturing capabilitity. Check out the video below for more about our equipment!